GSS favourite, tiger rock star is swamped with fans demanding a selfie. The font is exceedingly underwhelming given the title and BAEN. Those A’s…. Looks like a rip off of The Most Dangerous Game. I like how the sword handle looks a little like a fish. Cute! Artist is Sam Kennedy. Cover painting. @fred – ISFDB say artist is Stephen Hickman? This worries me greatly. The date is 2016, so a good five years after GSS started. Has Baen’s publicity department started using this site as a way to promulgate its otherwise pretty much interchangable covers? Are they specifically targetting us? I feel cheap and used. @Tat I have to admit, book covers have got better since we started. Though, not Baen and it has always been their strategy to stand out, which is great for us. Going to a new book store just isn’t the same. Where have all my muscle men being attacked by electric breathing dragon men gone?! WHERE?!? EDIT – By better I mean.. easier to take on a bus and not feel a little embarrassed. @gssadmin are you suggesting that this site is dependent on a finite resource? Well you can rock me to sleep tonight. @JuanPaul, GSSadmin: I worry about this. Not just the advent of kindles and other such toys but the move to trade paperbacks and means that SF covers are getting increasingly perfunctory. I see so many dark brown covers with a shady copper-brown planet and a tiny spaceship in the corner. Paperback design’s getting very dull, lots of herd-instinct among commssioning editors and me-too design decisions. For me, personally, the move to trade format means I don’t tend to carry new books in my pockets so I’m sent back to the second-hand paperbacks where some thought (not always the right thought) has been put in. I also spend less time on London buses now I’m in a far-off strange land. (Last time I took a bus in Providence it was after visiting a second-hand shop and biting the bullet to actually read ‘RX for Chaos’ but it was an unfamiliar route so I was looking out of the window wondering where the hell we were going rather than obsessing over whether the students and winos would think less of me). 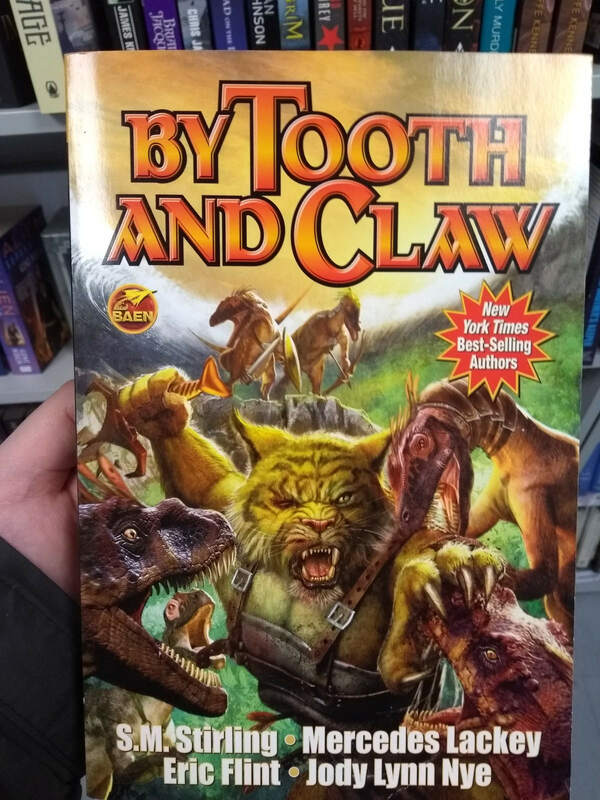 You’d think an anthropomorphic tiger fighting dinosaurs would be more interesting. But it’s BAEN, so . . . guess not. @tatwood covers have indeed become anemic. I just took a look at the early covers for The Name of the Wind. Stranger and much more engaging than the generic “artwork” thats on the paperbacks now. On the bright side, I have at least 15 more covers to send in, and I haven’t been to the used book store in months. Is what my brain said upon seeing just the top half of this. Hello, orange font. You’re rather boring for this publisher (save for the ridiculous A’s), but you make up for it with orange. I have no quarrel with the quality of the artwork. I’m sure the artist was told exactly what to paint and he executed it well. Nice details on the critters and the hippo head appearing to pop out of the dino maw is an amusing touch. Not his fault that he had to illustrate such a daft book, and he was relatively restrained. He didn’t lean into the Baen-iness of it all, which is good for bus readers but not so much for us. Although giving predators swords is kinda ridiculous. Tiger man looks like he’s going to lose more than an eye this time. Tiger: it’s what’s for dinner. @JuanPaul – Send some in. Same goes for the rest of you. We need to replenish the slush pile. @TW I’m working on it. Coming up with my oh-so-witty tag comments takes time. and drugs. lots of drugs. 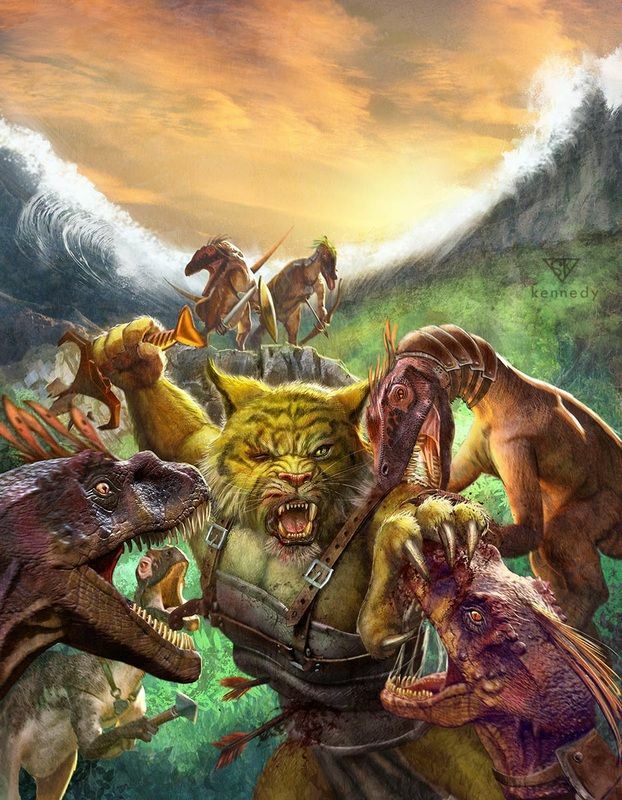 Baen will end up publishing cat books with up to 50,000 authors — one writer doing each word. I shudder to imagine what those covers will look like. “Busy and cluttered” will be too kind by far. There are still at least 10-15 books I sent in which haven’t been used. Admin and TW can always grab static images from the publisher (like the embiggened pic on “A Call to Doody”) to make up for my limited camera resolution in terrible hotel lighting.